Here’s a post in which I prove this site is really about anything – I am one eclectic theist, after all! – (see also my post on bacon provolone pasta sauce). Anyway, one fun and much healthier food substitute for sour cream is plain yogurt. Seriously, try it! It’s really tasty and has much less fat and more protein. It’s even better for you if you try it with Greek plain yogurt because then you get even more protein and less fat. It’s particularly good with Mexican food as a way to get that yummy creamy/sourness but without all the added fat of sour cream. Try it and let me know what you think! By the way, I’m not at all saying this should be used in recipes in which you cook with sour cream. I have no idea how it would modify said recipes. I’m only recommending it for use on tacos as a condiment. The moment I realized this would not be a good episode. I’m going through “Star Trek: The Next Generation” and reviewing every episode, complete with commentary and a grade from A-F. I’ve also included a score and comment from my wife, who has never seen the show before. There are SPOILERS for each episode below. The Enterprise is playing shuttle for delegates to a conference: two fish people and Lwaxana Troi. The latter is in midlife crisis mode for a Betazoid and goes after Picard, random people, Riker, and a holodeck character in turn. The episode follows Troi’s attempts at conquest and Picard’s evasions. In the end, Troi fails and leaves, after revealing the fish people as assassins. Those two words, which compose a ridiculous name, are instant episode-killers. I don’t remember every episode with the mother-Troi, but I’m going to take that as a blessing. Anyway, this episode was ruined the moment the elder Troi showed up and unleashed her innuendo-laden comments and ridiculous caricature of hyper-sexuality into the mix. The scenes with her pursuing Picard are generally painful and filled with poor dialogue. There are good things in the episode, like Picard’s genius move to use Data to use up all the time with Troi at dinner, the episode’s title as a pun, or Worf’s random admiration of fish-people “They’re a handsome people.” Picard’s introduction to the holodeck was also pretty funny, as the program continued to up the ante with violence when Picard just asked to relax. Ultimately, though, these moments are not enough to save the episode from the garbage heap. Star Trek poker is always awesome, and the introduction was once again awesome. Data’s interaction with Worf was hilarious. “Talk or play. Not both.” Worf, you complete me. 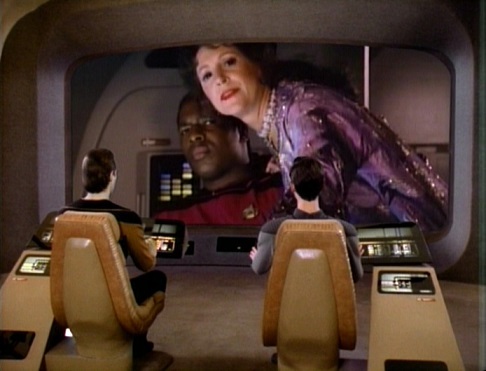 Anyway, this is one of those episodes that really sells TNG as a series. It’s a stand-alone, as they all are, but it has far-reaching plot threads that viewers can feel even with just one episode. It sets up future plot events–or at least makes it seem like we’ll encounter again. But it also looks backwards and fills in story for one of the key characters, Worf. Set that alongside a solid main plot with an awesome climax (Worf’s idea to save the day was just brilliant) and “The Emissary” is the best episode to come along in a while. There are few downsides to this episode apart from the fact that because it doesn’t really resolve the love story it introduces, it feels a bit anticlimactic at the end. Overall, though, with its dramatic plot, great character development, and very solid acting, “The Emissary” stands tall among the better episodes of the season. Star Trek: TNG– For more episode reviews, follow this site and also click this link to read more (scroll down as needed)! Drop me a comment to let me know what you thought! Don’t talk to someone when they’re reading, Wesley. Don’t do it! Oh… you did it. 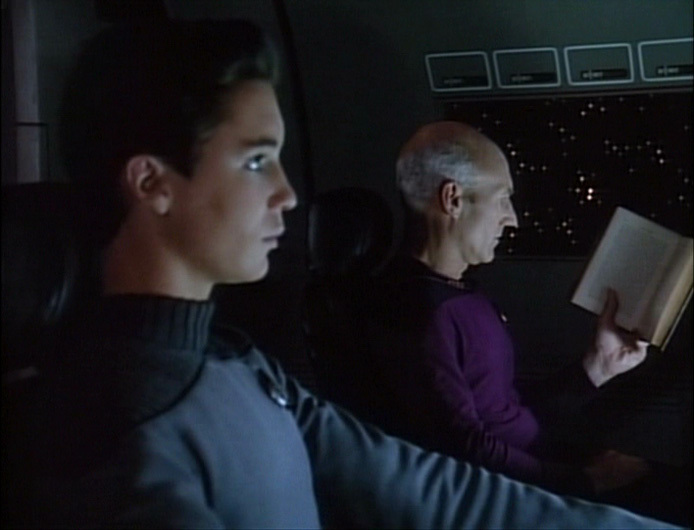 Picard has to travel with Wesley to a starbase because his heart is giving out and he doesn’t want to lose face. Meanwhile, Riker and the Enterprise respond to a distress signal, which turns out to be a trap to try to capture a crewman from the ship. Geordi is kidnapped and eventually freed by tricking the aliens into lowering their shields, while Picard’s condition in surgery plummets. Dr. Pulaski is flown in and able to save Picard. High fives all around. Another episode with lots of elements, but this time they got put together in a cohesive and believable way. The background for Picard’s character, told through a dialogue with Wesley on the way to the starbase, was interesting and gave Picard’s character even more depth. It also says something about Patrick Stewart’s acting ability that he’s able to essentially deliver a monologue about his past and keep the audience in rapturous interest without any flashback scenes. Well done! The main (or side?) plot with Geordi being kidnapped was a good premise, though the aliens couldn’t have been any dumber. It’s like they have an intelligence score in D+D of 3 or so (if you get that, you’re awesome). Anyway, it was resolved through some clever trickery, making light of a rather suspenseful situation (I mean, Geordi was basically tortured! ), but not in a dismissive way. It was pretty well-executed. The episode is not without flaws: the aliens are almost unbelievably stupid and one-dimensional, which makes it hard to believe they even managed to make it out of their beds, let alone off their planet. The fact that Riker doesn’t immediately act on Troi’s words telling him Geordi was in danger was really hard to comprehend, particularly since Worf concurred. As my wife said, and I agree, “When the Betazoid and Klingon agree on something, you’d better do it.” I mean seriously, your psychic counselor and warrior-man each say Geordi’s in danger! Time to act now Riker! Also, Pulaski’s bedside manner continues to be ridiculous. Overall, though, it was a fun episode with elements of humor and some awesome character building for Picard. I thought about scoring it lower than I did, but I enjoyed it too much to be realistic with anything lower. The Enterprise responds to a distress signal and beams up a bunch of displaced 19th century Irish people (okay they actually left Earth to try to live a simpler life, but whatever). As they try to figure out what to do with them, they go to a second colony which apparently is populated entirely by clones. The latter colony faces a crisis of genetic breakdown as their clones continue to deteriorate in genetic quality. They steal Riker and Pulaski’s DNA but are thwarted. Ultimately, the solution is to lump the Irish with the clones so they can have a broader genetic base and learn from each other. Okay, let’s just get this out of the way quickly: this episode is made up of two episodes. Halfway in you’re thinking it’s about the weird struggle of coping with some Irish people, then the rest of the episode follows the drama of the clones. It’s as though the writers just put two episodes with the same premise together and then hack-jobbed an ending onto it. First half is an episode about trying to find a way to deposit the Irish, and, of course, Riker’s latest affair. Second half is a more intense episode about clones desperate for aid. Then, the ending is put forward to try to tell you that, oh yeah, we decided to make this one episode. It’s too crazy. I should note the intro scene with Worf’s interaction with Pulaski was just awesome. Seriously, Pulaski still has a lot of growing up to do, but she delivered a great scene with Worf and the whole tea ceremony was epic. I absolutely loved it. Random comments: Can I just question why it took Starfleet a month to respond to the distress signal? I mean seriously, what if everyone were dead? Also, how many women has Riker been with at this point in the series? A lot. I know he and Troi aren’t officially a thing, but come on! Show some restraint! Anyway, the episode just seemed like two episodes that the writers decided to jumble together because they had similar premises. It just didn’t work. The ultimate solution–breeding with at least 3 different people–was absurd on its face both on the side of the clones and the Irish. Whatever happened to the Prime Directive, or does it not apply to human colonies? Moreover, how could Picard (and Troi, for that matter) sanction the “shotgun wedding” taking place (yes, that term was used)? It was just absurd. A roller-coaster ride of an episode with brilliant moments marred by lots of garbage time. I’m writing this post the night before the “Big Reveal” so this introductory part is without knowledge of what is going to show up tomorrow. I figured it would be worth writing about, even though my prediction is it’s going to be some compilation album or book or something I’m not going to buy. Maybe it will be a game, but I suspect any game that they’re showing characters from all the Final Fantasy games is not going to be one I’d enjoy. But hey, who knows! Maybe it will be the holy grail AKA Final Fantasy VII REMAKE!!! I’ll write more when the reveal happens tomorrow. Okay, so it is a game and it’s called Final Fantasy Record Keeper. Astonishing. Anyway, as I suspected it looks kind of like a cash-in on the whole series, though depending on how they do it it may be fun. The premise is some guy is studying with a Moogle and is researching Final Fantasy history. He’s going to research the stories of the games and you can pick up different characters along the way as you complete areas in the other FF games. The problem is that the reason we love final fantasy so much has been because of the stories told therein; but how do you tell a story in a mash-up game like this? I don’t know if it’s going to be possible. Color me skeptical and probably not playing. In the meantime. I hope FFXV will be awesome. It better be, considering how long we’ve waited. 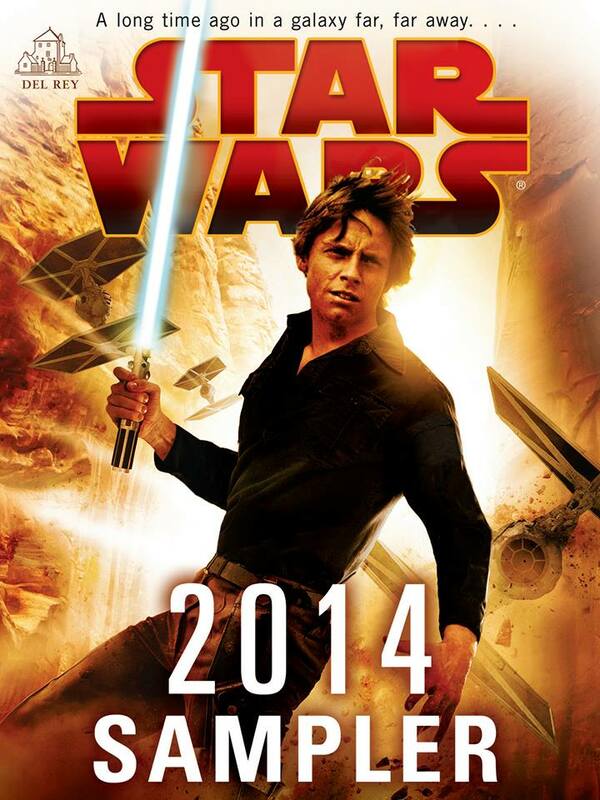 If you have some qualms about jumping in to the new “canon” novels now that the “legends” (read: Expanded Universe) series has effectively been shut down, now’s the time to check them out. There’s a free sampler of several of the new upcoming books so that we can tip our toes into the water before we dive in. Set during the legendary “Dark Times” between Episodes III and IV, A New Dawn tells the story of how two of the lead characters from the animated series Star Wars Rebels first came to cross paths. Bestselling Star Wars veteran James Luceno gives Grand Moff Tarkin the Star Wars: Darth Plagueis treatment, bringing a legendary character from A New Hope to full, fascinating life. The author of The Iron Druid Chronicles tells a thrilling new adventure set between A New Hope and The Empire Strikes Back, and-for the first time ever-written entirely from Luke Skywalker’s first-person point of view. When the Emperor and his notorious apprentice, Darth Vader, find themselves stranded in the middle of insurgent action on an inhospitable planet, they must rely on each other, the Force, and their awesome martial skills to prevail. Rest assured that I’ll be reading at least a few of the samplers to see if I want to pursue this new “canon” series after the shut down of the Expanded Universe! Let me know if you also read the sampler, and what you think! I have written about my thoughts on the closure of the Expanded Universe elsewhere. At last we reveal ourselves to the Enterprise; at last, we shall have revenge. I’m going through “Star Trek: The Next Generation” and reviewing every episode, complete with commentary and a grade from A-F. Here, we’re in season 2 and discussing episodes fifteen and sixteen. I’ve also included a score and comment from my wife, who has never seen the show before. There are SPOILERS for each episode below. Wesley is put in charge of a team for a geological survey of a planet in order to continue his development towards officer training. Meanwhile, Data receives a transmission asking “Is anyone out there?” and decides to answer it by saying “Yes.” It turns out the transmission is from a young girl whose planet is experiencing geological upheaval. Data wants to fix it, but this would violate the prime directive. Ultimately, Wesley’s team figures out a way to stop the upheaval while Data saves his interstellar pen pal, after which her memory is erased. Wesley’s struggles with his first command of a team were actually pretty compelling. It was delivered in a winsome way while also cashing in on the premise. Watching him in a command situation while also trying to figure out the nuances of the situation was well-done and even well-acted. The discussion over the Prime Directive between the senior officers was interesting, and the juxtaposition between Worf’s absolutism and Pulaski’s willingness to bend it was great. The ensuing debate over fate and the plight of a world was great, bringing forward philosophical ethical issues. Picard’s reasoning about moral certitude was catching, and Data’s insight into the issue not being a philosophical debate was well-placed. The episode raises these questions alongside the debate over wiping the memory of the alien girl. Pulaski comforts Data by pointing out they need to wipe the girl’s memory to allow her to stay on whatever path she was born into, but one wonders whether perhaps her path would be to discover that there is life “out there” among the stars. Similar questions about fate were raised with the previous discussion on the Prime Directive, and TNG often tries to answer the questions. Here, we’re basically just served a number of questions without a proposed solution. It’s frustrating and charming all at once, and it calls for reflection afterwards as well. Despite all these great aspects, there really was quite a bit of need for “suspension of disbelief” throughout this episode above and beyond the standard fare. Why didn’t Data immediately report this contact with alien life to Picard or a superior? Why does O’Brien unquestioningly transport Data and this alien to the Enterprise? Wouldn’t there be some kind of discipline for flaunting the Prime Directive so eagerly? Since when did they have the technology to wipe out memories, and how easily could they solve other Prime Directive issues with it? (Or apply it to crazy amounts of criminal activity?) How does a planet’s geological upheaval get fixed within seconds? The questions just keep coming, and the episode almost gleefully flaunts these issues without offering any explanation. They keep “Pen Pals” from being the great episode it could be. Q shows up and is petulant because Picard won’t make him a crew member so he shoots the Enterprise off to meet the Borg. The Enterprise is worse for the wear after the engagement and Picard appeals to Q to get them back home. He does, the end. Oh, and Guinan is apparently hundreds (or thousands… or millions… or !?) of years old and has some history with Q somehow. Oh, and there’s a new engineering Ensign named Sonya who’s overeager and a klutz. 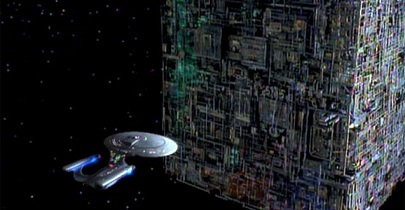 That said, the Borg are awesome. The creators did an awesome job introducing a truly sinister threat, but doing so in a way that isn’t over-the-top. There’s no question that the Borg are a major threat, but there’s also no question that they aren’t sporting devil horns and worshiping Satan; that is, they’re not evil for evil’s sake. There’s a mystery to them that makes the episode more appealing and wins me over despite its total lack of cohesion. If the episode had simply stayed about the Borg and Q trying to show Picard they need to prepare even more, it would have had more cohesion. As it stands, it’s got too much going on to be a truly great episode. There have been a few movies in the past which have sent me scrambling to find the book afterwards. None, I think, will I mark as important as “Edge of Tomorrow” (check out my look at the themes in the movie). 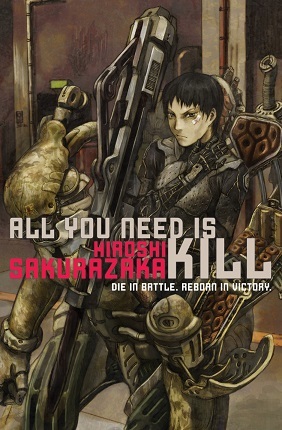 The book that inspired the brilliant film is All You Need Is Kill by Hiroshi Sakurazaka. I decided to pick up the book because I enjoyed the movie so much and had heard it was worth reading. Thank God I did!I found some really fascinating elements spread throughout the book, like sacrifice, comments on truth, and human nature. Mark it: 6/27/14 was the day I discovered Japanese Military Science Fiction. Yes, I already liked military sci fi. David Weber is my favorite author with his masterful Honor Harrington series. But All You Need Is Kill comes from a different cultural perspective–one in which the individual is not valued so much as the group. It reflected throughout the novel. Then, at the end, there was an advertising page. Apparently the publisher, Haikasoru, has brought over more Japanese military sci-fi. It is now time to devour these works. I must have more! All You Need Is Kill was just fantastic. It was a short book, but dense–each page seemed to be dripping with development. The characters received more development than one would think possible in 200 pages. It was a masterwork, if I’m going to be honest. I can’t wait to dive in and read more. Have you read any Japanese Military Sci-Fi? If so, what have you read? What other branches of sci-fi am I missing out on? Let me know in the comments!